What do you think about wearing a sculpture? Something I always wanted to do, I hear you say. No? Well, I’m not thinking of some sculpture made of stone or metal or wood – that would be a little inconvenient, let alone for the weight of it. I’m thinking of a knitted sculpture, made of some great yarn. Maybe inspired by one of your favourite topics or experiences or some great memory. Or something you saw somewhere. 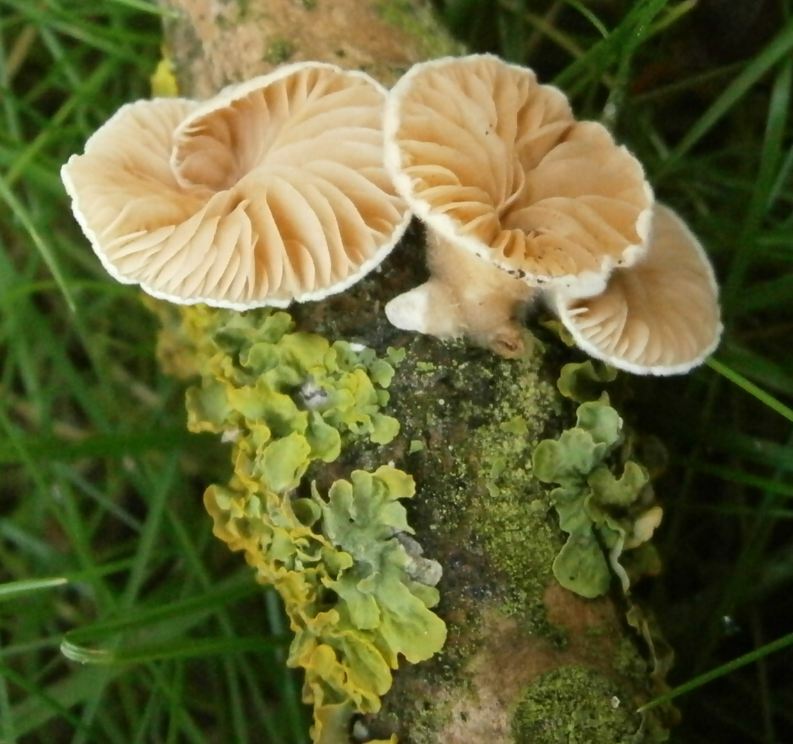 Like this branch with the little fungi and lichen on it. – Wait, I’ve got something similar in my stash. Some browns, the leftover yarn from knitting Dave, a green novelty yarn. Inspired by the SevenCircle neckpiece I made earlier, I knit five rings from different novelty yarns. 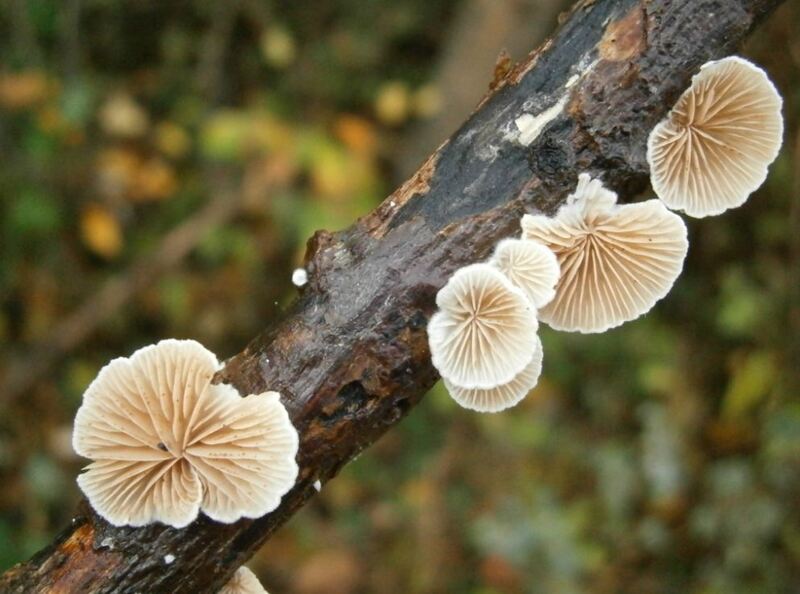 The flesh coloured sockyarn was perfect for crocheting little fungi. 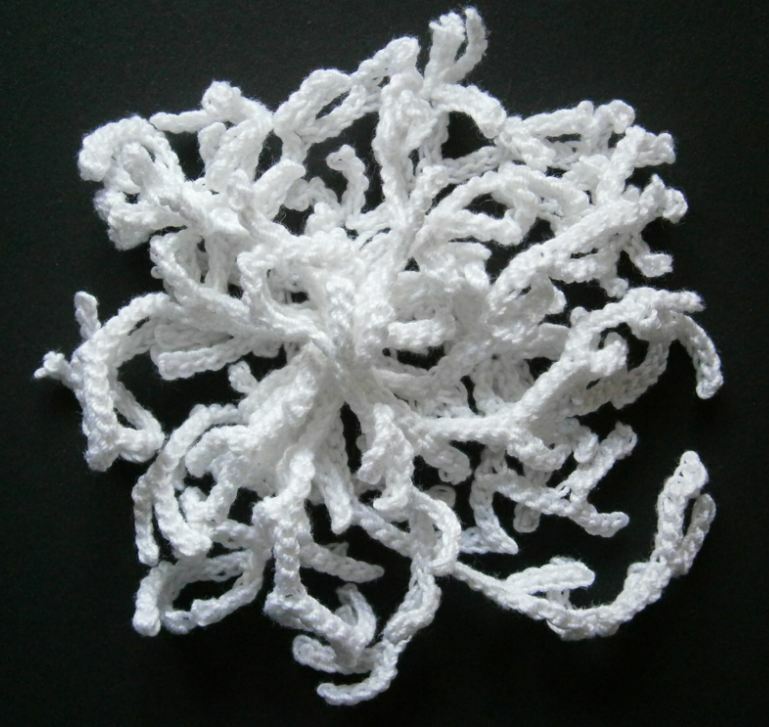 And two strands of perle cotton were the choice for crocheting some lichen. The finished piece is modelled again by my dear friend George. 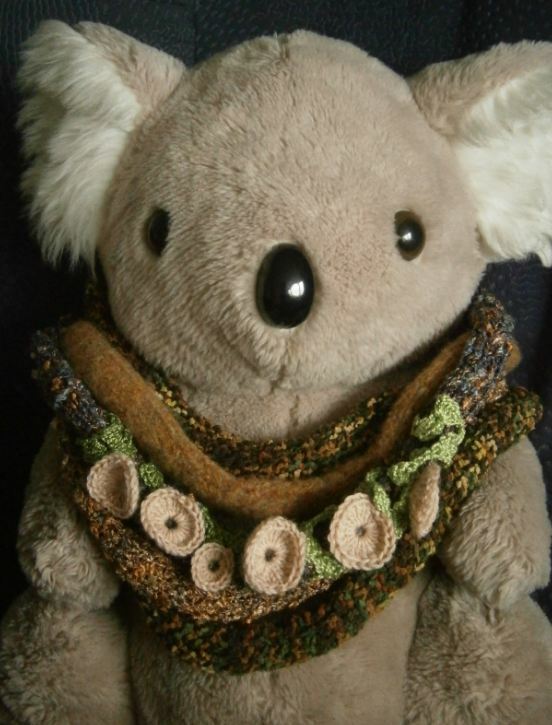 Some inspiration on knitted neckpieces to follow in my next post. Among the pictures I took recently for my first lichen post, there also was this one. ❗ Oh yes, a patch of lichen would look great. 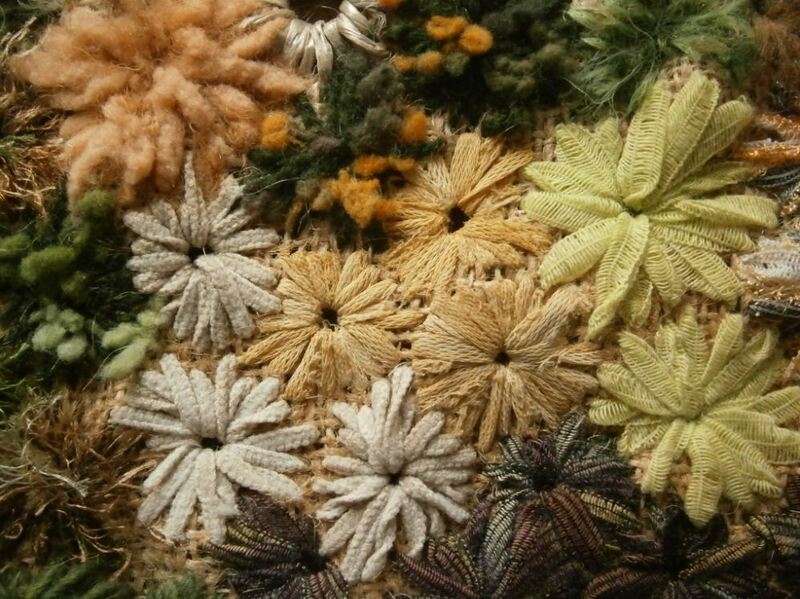 ❓ This must be easy to make with a similar technique I used for my seaweeds. 💡 I had a ball of white lace weight yarn lying around, bought for another project . I made a sample using a 1.75 mm hook (slightly smaller than a US size 0 = 2 mm). As single crochets turned out being too heavy I used sling stitches instead for my next sample. ➡ Try this: Chain about 40 to 50, return making sling stitches into the last 6 chains. Chain 5, return with sling stitches, join with sling stitch to inital row of chains. Continue making 5 sling stitches into chain. 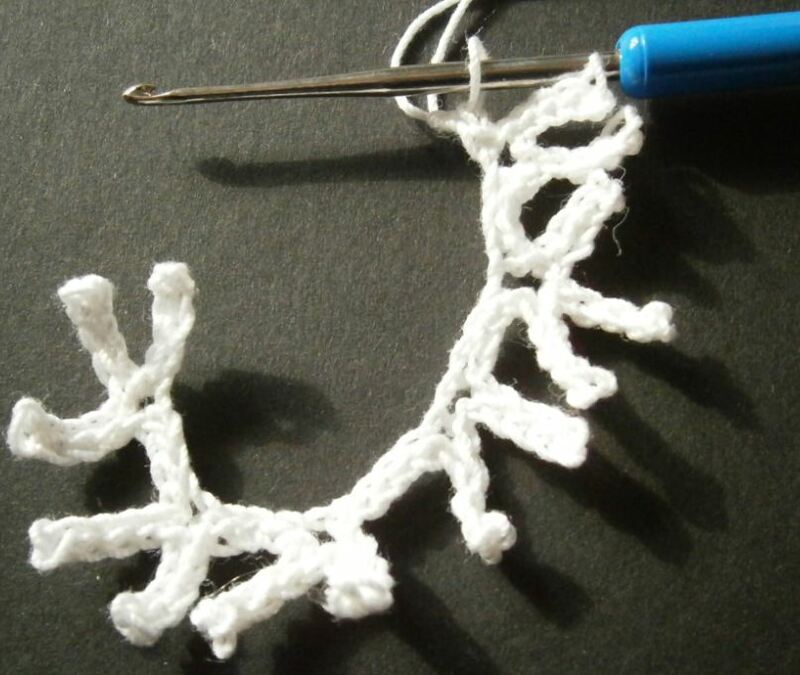 Go on making little ‘arms’ alternating with sling stitches into chain until you reach the end of the chain. Make new chain etc. Feel free to vary the number of stitches betweeen ‘arms’, make single ones or groups of two or three. Does that make sense to you? I’m afraid I’m not the best tutor. 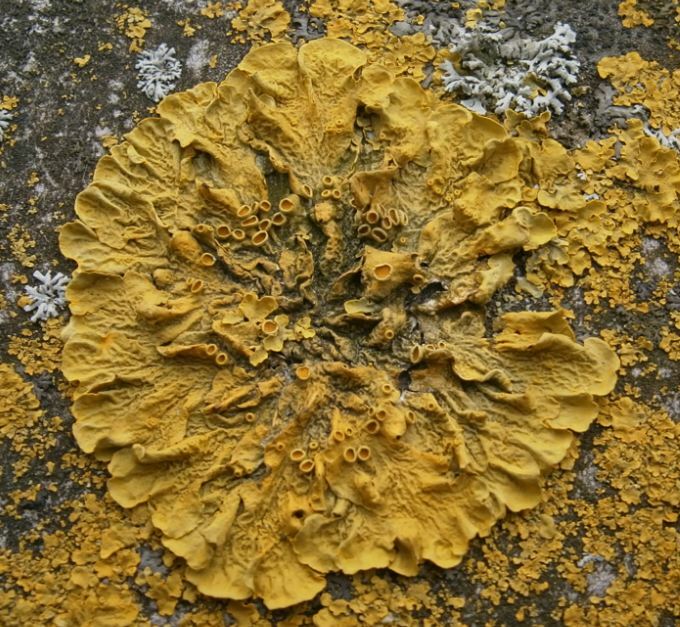 Anyway, in the end it may look something like this – a proper patch of lichen. If not – Congratulations, you’ve just grown a new species! I think I’m going to dye this with some diluted fabric paint to give it just the right colour. 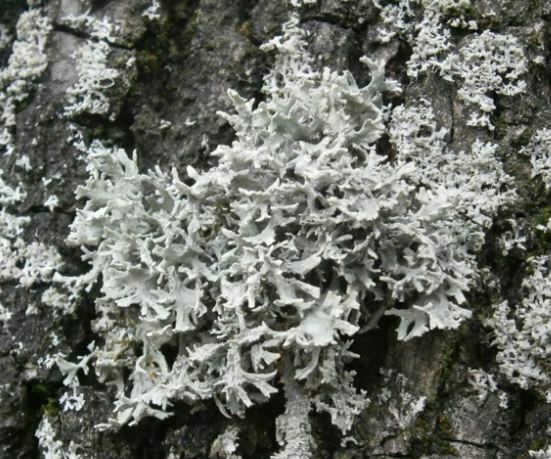 I could use it in a little 3D-project of more lichen. I’ve still got the variegated reds from my pink circle. 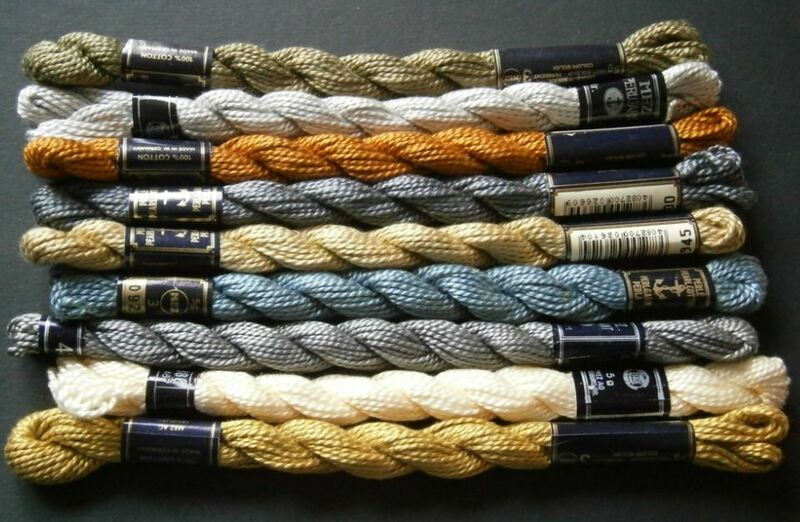 Maybe I should even try to use some of my heavy #3 perle cotton for a sample? 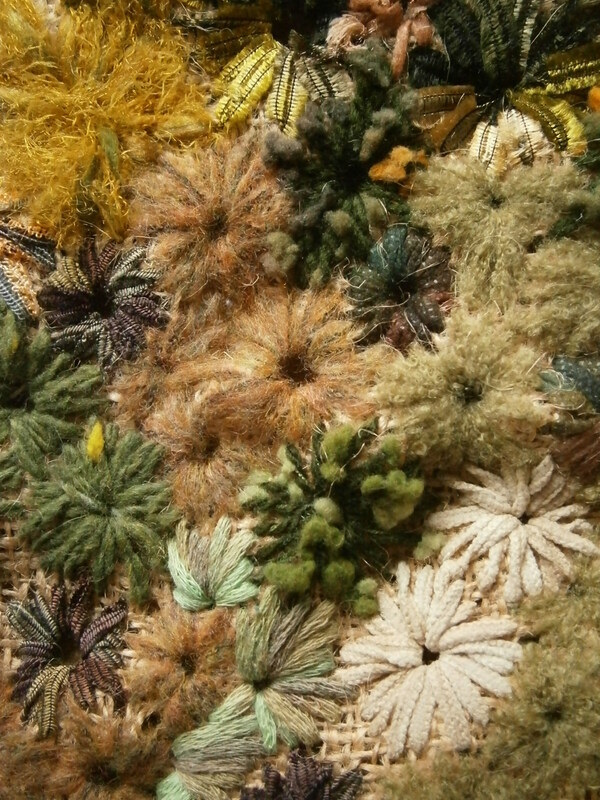 I’ve got various moss and lichen colours in my collection. They would make pretty new life forms. Hold on. I think I hear someone coming. Oh no. Dave, my muse. Yes, just a few minutes ago. You’re late this time, my friend. No doubt about that, faithful reader. The first sample looks promising, by the way. A splash of liquid lichen. Spilt from the bucket of some careless lichen creator. Or maybe he was just lost in thoughts. The instant it hit the surface it froze into this beautiful little sculpture. I’m fascinated by the structures and colours of moss and lichen. So when I read an article by Julia Caprara in Quilting Arts magazine (#19, Fall 2005) I was really excited. The author described how to create beautiful pieces of art just by using eyelet stitch and French knots. I felt immediately reminded of lichen. Must have. Or rather, must make myself. A visit to the local yarn store followed. The only thing I needed now was something to stitch on. Fortunately, the fabric store had just the right thing as Christmas was coming ahead. An open weave fabric of the kind that in former times was used for making sacks, called burlap or hessian. Using a blunt tapestry needle and some fancy knitting yarn, I worked little clusters of each colour on burlap. 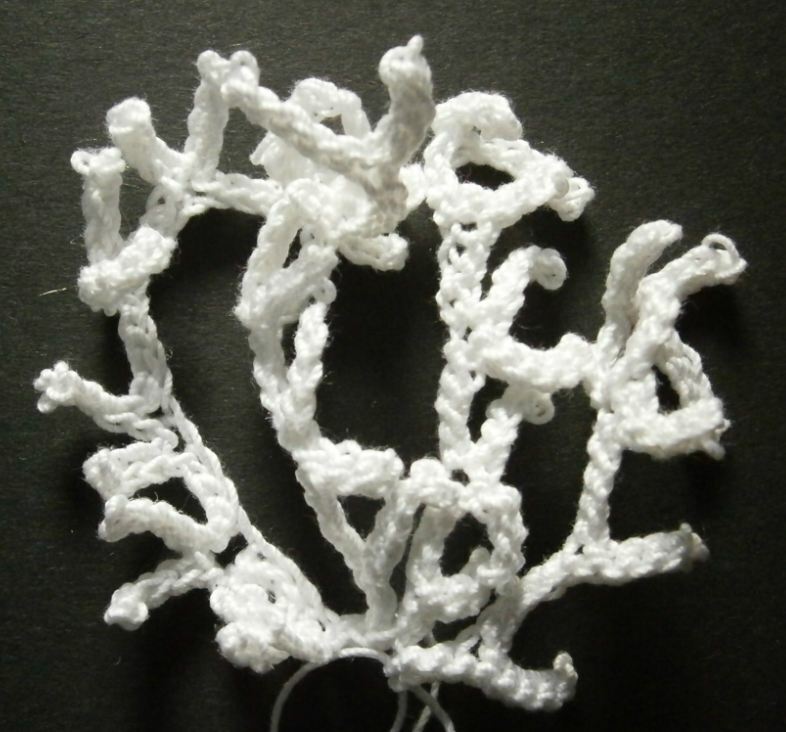 The eyelet stitch is very simple to make, just straight stitches worked in the round. Pull the yarn tight so a hole opens in the middle. You’ve got endless possibilities if you experiment with different base fabrics, various weights of threads and yarns, from delicate sheers and sewing thread to burlap and knitting yarns. Try finer threads on top of heavier ones. Vary the size of the eyelets. Let them join or fill the spaces inbetween with French knots. Or add beads. Catch the spirit of moss on a tree trunk, a bog scene, a frosty day, a night garden, or a sunny flower bed. I do like lichen. Do you?